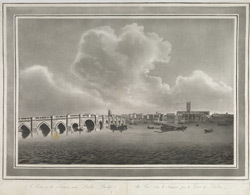 View of the River Thames near London Bridge, showing boat traffic on the River and some houses and a church along the banks. London Bridge crosses from Southwark into the City of London. It was there from medieval times and had 19 small stone arches, numerous houses and a chapel dedicated to St Thomas Becket in the middle. At the Southwark end was a gatehouse with drawer bridge , which was shut in times of rebellion or conflict.